Removing a mechanic doesn't mean you just remove everything. This is a walking sim, not an rpg without a mechanic. Dope music though. it's the type of game that you don't expect in a gamejam, Good Game! A sweet game with some good narrative sense. It's nice to see games like these pop up from game jams, as debatable as the thematic fit is to people. As cute as it is, this isn't really "genre without mechanic." It just doesn't have any mechanics. In our game we also removed enemies from a genre that normally would have tons of 'em, but it's cool to see how it affected both games in different ways! First i thought it would be a walking simulator, then you introdused shields and potions. I like the build up a lot. I also really dig the character and the walk animation cracks me up - I want to see more of this long legged tribe! Thanks! I agree with the description. 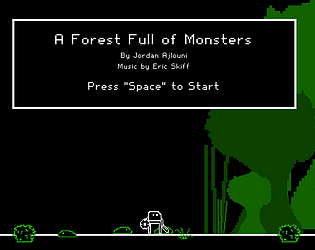 The game jam required a description, but I plan on removing it after the jam. Loved the commentary. Really liked the false expectations and how it didn't linger longer than it needed to. Awesome job! Nice story, but not much gameplay. It was really interesting. I loved how the story didn't do a big song and dance in front of your face but was in the background and genuinely made me think about how I treat strangers. Good job!